Armenia has the necessary scientific and human potential to produce real outcomes which will be essentially more valuable than money, Prime Minister Nikol Pashinyan said today as he met with members of the National Academy of Sciences (NAS). In his speech at the NAS annual forum, the chief of cabinet elaborated on the state’s expectations from the scholars, appreciating the Academy's rich history as the generator of the “glorious chapters of the Armenian and world science”. “I can say what the state or government expects from science. 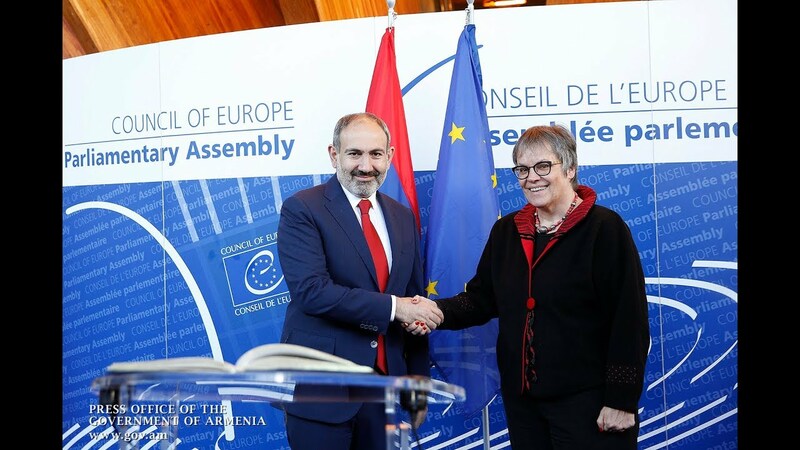 We have declared our vision of the Republic of Armenia as a technological country, and we are hopeful that science and the scientific potential –as well as the National Academy of Sciences – will serve intensively to meet this political vision,” Pashinyan noted. He said that at his meetings with international scholarly circles, he repeatedly stresses Armenia's role as a one-time "silicon valley" for the former USSR. The premier addressed first the integration of science into education (especially university education), noting that his government focuses also attention to applying the world’s leading countries’ best practice to the educational institutions of Armenia. “This is how we are going to build our strategy: we will try, to the best of our efforts, to integrate a maximum number of the most effective research, i.e. – scientific trends, into education. So our vision, notably, consists in delegating certain functions – traditionally perceived as functions vested in the government – to the scientific-education sector to enable, first of all, scientists to be better integrated into the economy and the management of public affairs, as well as students - to not only acquire knowledge but also practice the theories learned,” Pashinyan said. Pashinyan further addressed the integration of science into the economy and the Armed Forces of Armenia. He said that all the pressing issues were discussed with representatives of the Academy and the Ministry of Education and Science (including Minister Arayik Harutyunyan) to outline the key priorities for the government to boost cooperation with NAS, and the scholarly circles in general. Pashinyan said that the government needs to revise the philosophy and principles of financing the scientific sector "to ensure an equal and fair distribution of resources". “The government today has specific keynote proposals in the field of science. And when those keynote proposals were still under discussion, there were zero sums – no penny literally – available for funding. So the more convincing the authors of those projects sound while introducing proposals – elaborating on the strategic significance and benefits – [the higher the chances that] the money will come by itself. I can state with certainty today that I do not envision any impossibility for the Government of Armenia of finding money to push ahead with such a project. I do not envision any impossibility in New Armenia of implementing any project for the sole reason that there isn't money for that. Money is, after all, created thanks to the human mind, human thought, idea, enthusiasm and work, and hence, whenever confronted with the question whether there is any money or not, our response should deal with how much enthusiasm we have, how far our strength of mind goes, and how strong our willpower is, as well as the conviction that what we do is worth really more than money. “I am confident that we have the necessary scientific human potential, the necessary mental and moral potential in the Republic of Armenia to produce outcomes which stand well above money. Those outcomes will bring with them unlimited money, because money is not absolutely of primary importance. The primary value is idea – which has always been, is and must remain the winner,” Pashinyan said, according to a press release by the Office of the Prime Minister of Armenia. The event also had other keynote speakers, including Hrant Matevosyan, an academician-secretary and a correspondent member of NAS, Pavel Avetisyan, the diretor of the Institute of Archeology and Ethnography, Armen Sergeev, a foreign member of the Academy and Arsen Hakhumyan, a correspondent member and the director of the Institute of Radiophysics and Electronics. NAS President Radik Martirosyan greeted all the participants in an opening speech to introduce the major scientific achievements and their practical implications. He also addressed the training of human resources and other activities and achievements of 2018 )particularly the involvement of young scientists in scientific reasearch, etc.) Martirosyan said that last year they celebrated the Academy's 75th anniversary, organizing differnet forums and other events to raise the importance of different scientific endeavors.